AstroCryptoTriviology: A Jones for MOL #3: Down the Hatches! Any launch from a standing start into low Earth orbit has to be an exhilarating experience by itself. It can also prompt physiological responses. During a MOL launch, the Titan-IIIM booster would have leapt off the pad with the ignition of the paired solid rocket boosters flanking the first stage, the acceleration load increasing as the solid fuel was burned and the mass of the stack decreased. When the exhausted solids were jettisoned and the first stage continued to burn its fuel, acceleration would have built up steadily again, then dropped to zero at staging, and almost immediately resumed and built up again as the second stage accelerated the vehicle into orbit, only to drop immediately to zero again at burn-out about 8½ minutes after launch (ref. 1). But for the now-weightless MOL pilots that would have been only the start. One of the pilots, probably the co-pilot on the right side of the cockpit, would have unstrapped from his ejection seat and turned around in a volume literally smaller than a 1960’s telephone booth (ref. 2). 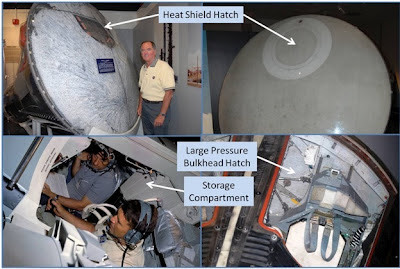 Facing the aft bulkhead of the capsule, he would have unsealed and stowed the 24-inch (61-cm) large hatch in the capsule’s pressure bulkhead, and after that, the similarly-sized heat shield hatch (see Figure 1). Figure 1. View of the two crew transfer hatches in Gemini-B, the heat shield hatch installed and the large pressure bulkhead (LPB) hatch stowed. Credit: McDonnell Douglas Aircraft Corporation, courtesy of Dr. Dwayne Day. With the two hatches stowed, the co-pilot, still wearing his bulky MH-8 pressure suit (ref. 3), would have squeezed through the slightly wider tunnel, 31 inches (79 cm) in diameter and 11 feet (3.3 m) long, passing through the Gemini-B adapter module and then the MOL’s unpressurized equipment compartment finally to arrive inside the pressurized laboratory module, the pilots’ home for the next 30 days. This procedure for moving from the Gemini-B capsule to the MOL was evaluated in brief weightlessness during parabolic flight aboard an Air Force KC-135 in March 1966. Project engineers went through all the motions while wearing Gemini-style space suits (ref. 4), both unpressurized and pressurized, and then repeated them again in light-weight aviators’ flight suits (ref. 5). At least three of the Aerospace Research Pilots assigned to MOL repeated the process that same month (ref. 6) also wearing Gemini-style suits. Each test run occurred in discrete 25-sec. steps, because that was the duration of the parabolas that the KC-135 could fly. As might be guessed, two men could make the transfer easily in a single parabola while in flight suits, but it took several parabolas for just one man to struggle through it with his suit pressurized and stiff. In those early days of spaceflight, the problem of space motion sickness was suspected but not yet demonstrated. But if anything would have provoked it, the MOL gyrations would surely have done so. Provocative or not, such gyrations were not unprecedented. Wally Schirra, on his Gemini 6 flight, reported getting completely out of his ejection seat on the left side of the cockpit and turning around to close the balky door on the storage compartment between the two seats’ headrests (ref. 7). 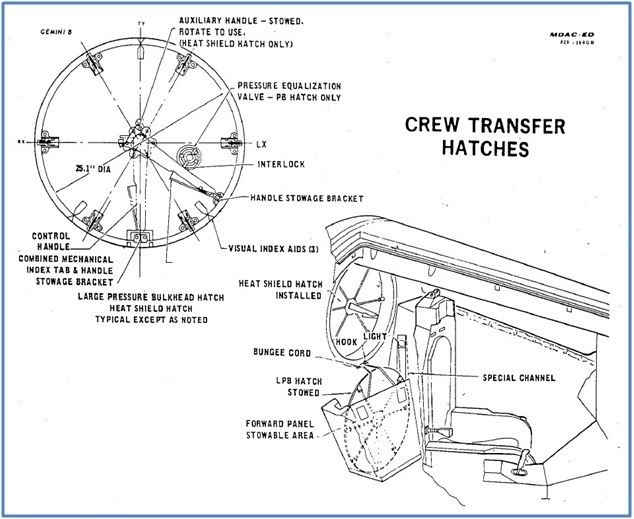 That storage compartment was to be replaced by the third hatch on Gemini-B, so Schirra unintentionally evaluated the first transfer step in flight. Other Gemini astronauts must also have moved around in their small cabins—probably like shifting in your economy-class airline seat—maybe just to experiment with weightlessness, but probably to unzip their space suits around the crotch and a little way up the back to use the plastic bags provided for calls of nature (ref. 8). That there were two separate hatches on the Gemini-B is not widely understood. People have seen the circular cut through the heat shield on the reused Gemini 2 capsule tested in re-entry in 1966 and the circular hatch on the back wall of the unflown Gemini test capsule in the National Museum of the U.S. Air Force (see Figure 2), and have assumed, logically enough, that those were front and back views of the same hatch. 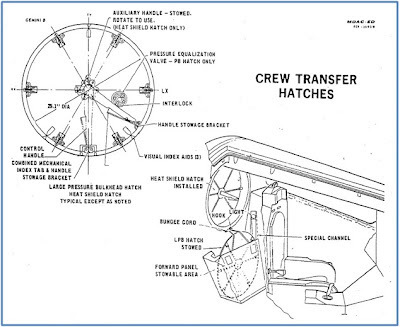 However, MOL documentation acquired from the Maxwell Air Force Base archives in 1999 by Dr. Dwayne Day shows that there were two separate hatches (see Figure 1 again). Even watching the films from those KC-135 flights (ref. 5) doesn’t make the distinction obvious: opening and closing the heat shield hatch are plain enough when viewed from inside the transfer tunnel, but manipulation of the large pressure bulkhead hatch is almost completely obscured by the faux pilot in the cramped Gemini cabin space. Figure 2. Heat shield hatch in Gemini 2 capsule on display at NASA Kennedy Space Center visitor center (top left) and in unflown Gemini-B test capsule at National Museum of the U.S. Air Force (top right). Large pressure bulkhead hatch of the Gemini-B test capsule (bottom right) in the same location as the storage compartment in the standard Gemini (here shown in the Gemini Mission Simulator). Photo credits: NASA (top and bottom left), John Charles (top and bottom right). But the evidence is ambiguous as to whether there was another sealable hatch between the Gemini-B heat shield and the interior of the lab module. A set of watercolor illustrations of typical MOL scenes, probably commissioned by the McDonnell-Douglas Aircraft Company, MOL's manufacturer, in late 1967, shows a hinged hatch at the laboratory end of the tunnel in one view but not in another (see figure 3). However, there is no such hatch in the full-scale mockup flown on the KC-135 or in a photo of the full-scale high-fidelity mockup of the MOL’s interior made by McDonnell-Douglas (see figure 4) at about the same time (ref. 9). Richard Truly, one of the MOL pilots who trained on the KC-135 mockup in March 1966, clearly remembers the two heat shield hatches he struggled with during those parabolas, but is not sure about another hatch at the other end of the tunnel. Figure 3. Two watercolor images circa late 1967 illustrating the MOL pilots’ initial entry into the laboratory module. Notice the presence of a hinged hatch at the lab end of the transfer tunnel in the panel on the right, but the absence of any such hatch in the panel on the left. The circular feature behind the pilot in the left panel is not in the same position as the hinged hatch in the right panel, and is thus probably not meant to represent it. Credit: McDonnell Douglas Aircraft Co.
At least, the mockups don’t show signs of a permanent, hinged hatch, unlike the watercolors. But that does not mean there wasn’t a removable hatch there. The two Gemini-B hatches described earlier were both removable. In addition, the Apollo command module had a removable plug hatch at the top of its docking tunnel, so the concept was neither unprecedented nor unknown to the MOL designers. Figure 4. 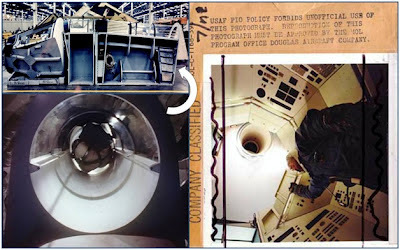 Views of two MOL mockups showing no evidence of a tunnel hatch. Top left shows cut-away mockup used on KC-135 parabolic flight testing of transfer from Gemini-B (left end) through tunnel to where MOL would have been (right end). Bottom left view is 90-degree rotation of top left view. Right panel shows view up from MOL floor toward top of module, with tunnel entry near left center. (Mark-ups on original.) Credits: McDonnell-Douglas Aircraft Co., courtesy of Dr. Dwayne Day (top left), Spacecraft Films (bottom left) and Andrew Cochrane (right). Apollo’s forward docking hatch is similar to what might have been a removable MOL tunnel hatch. It was 30 inches (76 cm) in diameter and weighed 80 pounds (36 kg). It was latched in six places and operated by a pump handle. At the center was a pressure equalization valve, to match the pressures in the tunnel and lunar module before the hatch was removed (ref. 10). Something like the Apollo plug hatch sounds ideal to seal off the tunnel, but there is no evidence for its existence in any of the available source documents. The KC-135 tests, which analyzed all the steps in the transfer from Gemini-B to MOL and back, did not include such a hatch, either hinged or removable. Clearly such a hatch was not part of the flight design, at least not in March 1966. In the absence of any evidence to the contrary, I conclude that there was no independent pressure-seal capability for the transfer tunnel: the tunnel would have been open from the Gemini-B heat shield all the way to the interior of the MOL habitable volume. This is not unique in spaceflight: the Spacelab modules carried in the payload bay on 15 Space Shuttle flights (ref. 11) were connected by a long transfer tunnel to the Shuttle’s crew compartment, and there was no hatch at the Spacelab module opening (ref. 12). Gemini-B/MOL and Shuttle/Spacelab were admittedly different vehicles, but seeing the same unique feature in different spacecraft reassures me that it was real and not an oversight on my part. By now you might be thinking that all of this is akin to calculating how many angels may dance upon the head of a pin. But the absence of a hatch at the lab end of the transfer tunnel is important because it leads directly to the the very topics that originally inspired this blog series, and which will be covered in upcoming posts. 1. Estimated from “Titan III Typical Flight Sequence” (p. 278), in Isakowitz, S.J., International Reference Guide to Space Launch Systems (Washington, D.C.: AIAA, 1991), pp. 263-80. 2. “How Many in a Phone Booth?” no writer attributed, The Harvard Crimson, July 23, 1959, http://www.thecrimson.com/article/1959/7/23/how-many-in-a-phone-booth/ (accessed 30 Aug. 2012). The article gives the volume of a phone booth as 63 ft3 (1.8 m3); Gemini cabin volume is widely reported as 95 ft3 (2.5 m3), for both pilots. 3. Thomas, K.S., and H.J. McMann, US Spacesuits (Chichester, UK: Praxis Publishing, 2006), Chapter 8: U.S. Air Force spacesuits. 4. Astrospies, PBS Nova, excerpt starting approximately 8:30 elapsed, http://www.youtube.com/watch?v=4yXWRCyhQ2Y&playnext=1&list=PL97CCE763F5CBF0A3&feature=results_video (accessed 26 Aug. 2012). 5. “MOL zero gravity testing, McDonnell photography, Wright-Patterson AFB, March 1966,” on CD: Man in Space, U.S. Air Force manned space projects, Spacecraft Films, 2007, www.spacecraftfilms.com. 6. Truly, Richard, personal communication (email), to John Charles, June 29, 2012, recalled flying on the KC-135 with his friends Michael Adams and Jack Finley on March 24-25, 1966, at Wright-Patterson AFB. 7. Schirra, W.M., and T.P. Stafford, “Gemini VI Technical Debriefing, Dec. 20, 1965,” reproduced in Godwin, R., Gemini 6, The Mission Reports (Burlington, Ont., Can. : Apogee Books, 2000), p. 113, 117. 8. Kemmerer, W.W., and J.W. Morar, A Review of Spacecraft Waste-management Systems, NASA TM X-1851 (Washington, D.C.: NASA, 1969). See figure 10; http://ntrs.nasa.gov/archive/nasa/casi.ntrs.nasa.gov/19690023882_1969023882.pdf (accessed 16 Sep. 2012). Poor quality document reproduction observed. 9. Cochrane, Andrew, MOL Update #4, July 6, 2012, http://blog.theavclub.tv/post/mol-update-4#more-2980 (accessed 20 Aug. 2012). 11. Spacelab Payloads on Shuttle Flights, http://www.nasa.gov/mission_pages/shuttle/launch/spacelab_shuttle.html (accessed 16 Sep. 2012). 12. Spacelab News Reference, NASA Marshall Space Flight Center, document number 14M983 (undated, ca. 1980), Sec. 3.2.2. Tunnel Systems, p. 3-19, http://www.scribd.com/doc/44577396/Spacelab-News-Reference (accessed 29 Aug. 2012).